UVA uses a variety of best management practices (BMPs) to minimize impacts to stormwater resulting from development on University property. Some BMPs focus on reducing nutrients, sediment, and other pollutants to improve stormwater quality. Other BMPs focus on increasing stormwater infiltration and reducing flow volumes, which reduces flooding and erosion downstream. Some BMPs can both improve quality and reduce quantity. Often several BMPs are used together to provide maximum stormwater protection. 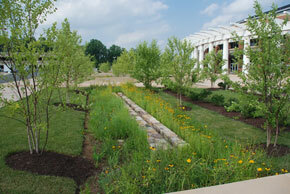 The University utilizes a variety of BMPs on Grounds to minimize negative impacts to stormwater. Cisterns and rain barrels store rainwater collected from roof drains. 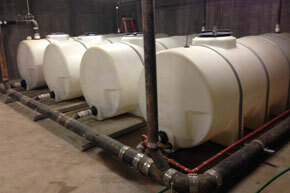 They provide water storage during large storm events to prevent flooding and downstream scouring. The water in these cisterns can be used for various gray water uses, including garden or lawn irrigation. UVA has cisterns installed at Garrett Hall, New Cabell Hall, the Amphitheater, and the Astronomy Building for irrigation of the student garden. 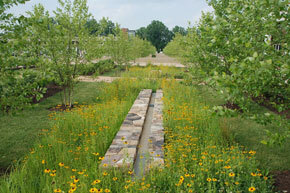 Bioretention areas, also known as rain gardens or biofilters, provide on-site treatment of stormwater runoff by mimicking a natural filtration system using engineered soils and special plants. Some pre-fabricated biofilter units are available. 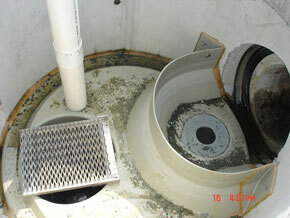 The filtered runoff can be collected in an underdrain and directed into the storm drain system. Bioretention areas typically include a diversion mechanism so that large storm events don’t flood and destroy the filter. 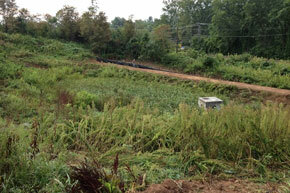 They typically treat a drainage area of five acres or less and have a high pollutant removal rate. UVA has many biofilters, including those at the Dell, Campbell Hall, John Paul Jones Arena, South Lawn, Bice, New Cabell, UVA Clinical Lab, Sieg Warehouse and the Alderman Road Pumping Station. Vegetated swales are open channels that direct water through vegetation to slow it down and allow sedimentation, filtration and some infiltration. They can be used as their own BMP or be incorporated into the design of others, to direct water into a biofiltration area or detention basin. These swales treat a small drainage area but provide good pollutant removal and some infiltration and flood protection. Infiltration trenches are shallow, flat depressions that collect stormwater and allow it to infiltrate into the soil. 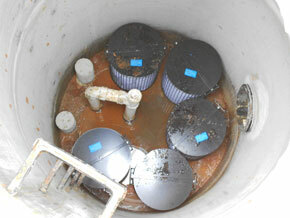 They have high pollutant removal efficiency and help to recharge the groundwater. Infiltration trenches are challenging to apply to UVA because of the clay-like nature of Charlottesville soil that makes infiltration slow. UVA curently has infiltration basins located at the Baseball Stadium, JAG School, UVA Child Care Center and Arlington Boulevard. These devices modify a manhole or catch basin to separate out pollutants from the storm water system. There are many different designs and variations, but all contain internal components that trap oil and other floatables. They are located in many parking garages, UVA Parking and Transportation bus depot, and Facilities Management compound . These are all areas where vehicles are stored and maintained, where oil often drips onto pavement and can be washed into the storm system. The University has oil water separators located at the 911 Emergency Communication Center, Facilities Management, Central Grounds Garage, Emmet Street Garage, Arena Garage, Darden Garage, Scott Stadium Garage, South Garage and UVA Parking and Transportation. BaySavers are located at UVA Parking and Transportation and the 11th Street Garage. Permeable pavement reduces impervious cover and therefore stormwater runoff by allowing water to soak through the paved surface and infiltrate into the ground beneath. This pavement can be permeable concrete, permeable asphalt or paving bricks. 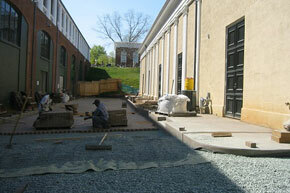 UVA has permeable pavement behind the Amphitheater and in portions of the R1 parking lot next to Ruffner Hall. A proprietary device is a manufactured stormwater treatment structure that settles or filters out sediment or other pollutants. Each manufacturer has a different design but they usually incorporate the use of a filter or a chamber where water slows down and sediment settles out. There are filters installed under Lannigan Field and sand/grit inteceptors at the Emmet Street Parking Garage and Bryan Hall. Stream daylighting restores a formerly piped, channelized, or otherwise altered stream to a more natural state on the surface. 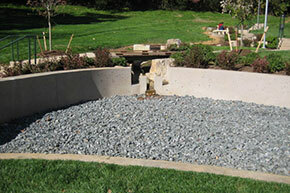 Stream daylighting restores aquatic habitats and ecosystems while improving area aesthetics and runoff quality. 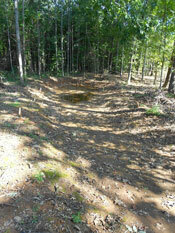 A dry pond is a basin with outlets designed to temporarily detain stormwater runoff. These basins are not large permanent pools of water, but may have small pools at the inlet or outlet. 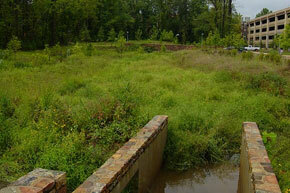 Reductions in peak flow associated with large storm events make dry ponds an effective flood control strategy. The temporary storage of water during storm events allows sediment to settle out of the water before continuing in the storm sewer system, but dry ponds only have moderate pollutant removal. Underground detention allow for storage and slow release of stormwater during large storm events without using a wet or dry pond. There are many different types of underground storage systems including stone or plastic systems, oversized perforated pipes, and storage tanks. These systems reduce peak flow to prevent flooding and scouring downstream. Green roofs absorb, store, and later evapotranspire precipitation which reduces the volume of stormwater entering the storm sewer system. They offer benefits to the building including reduction of urban heat island effects, and increased thermal insulation. 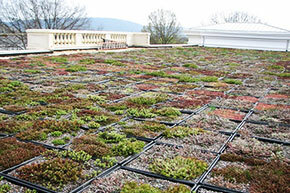 Green roofs are classified as extensive or intensive, both of which are present at UVA Extensive green roofs have six inches or less of soil and plant medium. Newcomb Hall, Garrett Hall and Rouss Hall are a few of the extensive green roofs at the University. Intensive plantings are those that are thicker than six inches, and can be found at Rouss Hall. In addition to the aformentioned buildings, green roofs can also be found on Nau Hall, Gibson Hall, the South Lawn Walkway, Robertson Hall, Claude Moore Nursing Education, MR-5 and MR-6. Wet ponds are basins with a permanent pool of water designed to detain stormwater to promote sediment settling and pollutant removal through biological activity in the pond. A sediment forbay, or small pool, can be used as pretreatment to remove coarse sediment particles before entering the pond. Vegetated buffers around the pond protect the banks from erosion and provide additional pollutant removal before overland runoff enters the pool. 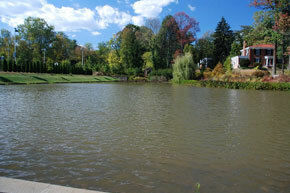 Wet ponds provide flood control and channel protection. Although wet ponds do not provide groundwater recharge due to accumulation of debris on the bottom of the pond, they are one of the most effective BMPs at removing stormwater pollutants. The stream at the Emmet/Ivy Parking Garage is an unnamed tributary to Meadow Creek. 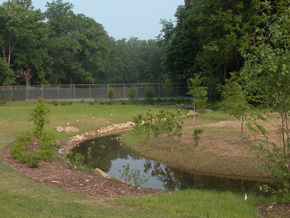 Similar to the Meadow Creek daylighting and Dell Pond installation, the Emmet/Ivy wetlands project was undertaken to improve water quality and reduce the rate of stormwater leaving the site. The wetlands provide areas to allow the stream to overflow naturally and provides for some infiltration of water while allowing sediment to settle out rather than being sent downstream. In addition, the plants in the wetland uptake water and serve to filter nutrients and other pollutants from the stream flow.